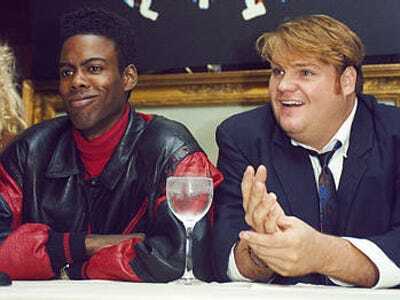 Here’s one that feels like it’s destined for the “bad idea” file: “The Fatman Cometh,” a play about the last 18 months of comedian Chris Farley’s life, is currently being workshopped in private readings. It’s not clear from what’s out there right now whether the production is supposed to be a comedy, a tearjerker, or both. But turning this concept into a hit would be a huge uphill battle for endless reasons, chief among them: the depressing subject matter; the inevitable controversy over accuracy (one character is described as a “personal manager and an amalgamation of all of the authority figures in Farley’s life and career”); and the fact that most Americans would probably rather stay home and watch “Tommy Boy” again than pay to see an actor try to fill his shoes. The play was written by Charles Messina, who’s interpreted the lives of Jacqueline Kennedy Onassis and Freddie Mercury in off-Broadway productions. Click here to see the poster he’s currently circulating for the production.